This magnificent 3 bedroom luxury bungalow is located in the much sought after area of Sea Caves and boasts a separate building which could easily be converted into a studio apartment. TITLE DEEDS. Located in a very quiet area it offers stunning sea views, and has the most beautifully landscaped, mature gardens and is the last word in taste and high quality specifications. 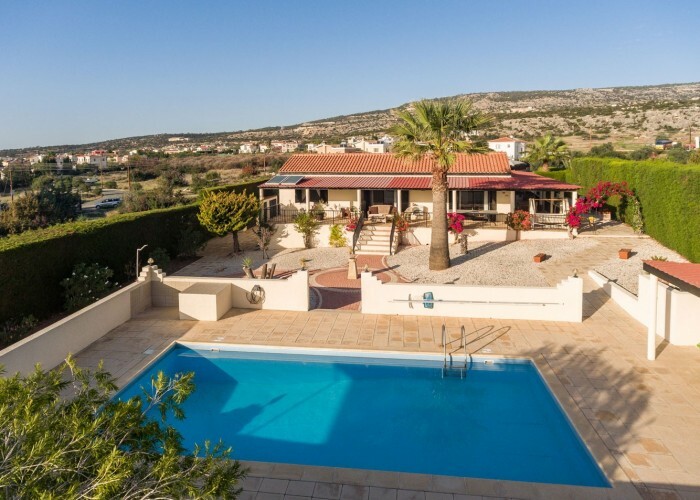 Standing on a plot of 2200m2 in an exclusive and very quiet area, the world famous Coral Bay beach is a few minutes’ drive away, whilst local amenities are within easy walking distance. Imposing double gates lead to the driveway which is large enough to easily accommodate 5 cars. To the right of the driveway is the covered car port- essential for protection from the blazing summer sun- and to the left is the front garden with features such as a gazebo and covered giant draughts board and pieces. Four steps lead to the front door and once through the front door it is easiest to split the bungalow into north and south wings. The north wing is basically the living area and includes a top quality French designed kitchen and utility room. These rooms boast a circular table and 4 chairs, copious amounts of cupboard space and beautifully crafted ceramic work tops. In addition there are many top of the range white goods including 2 fridge/freezers, one BOSCH and one SAMSUNG, a washing machine- also BOSCH, a SUPER SILENCE dishwasher as well as a ROSIERS oven. A mixed gas/electric hob completes the kitchen features. The lounge/diner is very big. 2 sets of patio doors lead to the south- west facing covered veranda which in turn overlooks the pool area. One very unusual feature of the lounge/diner is the marble topped divider which, although the room is open plan, gives the impression of being two rooms. The diner contains a classy looking table large enough to easily accommodate 6 people. To give an idea of the size of the lounge, it currently houses a 65 inch SONY flat screen TV which is perfect proportion to the size of this impressive lounge. In addition there is a 3 seat settee, a 2 seat settee and an armchair. All the furniture is high quality including a very attractive coffee table and the log effect gas fire – ideal for taking the chill off during the winter evenings. A family cloakroom completes the rooms in the north wing. Each of the three double bedrooms is in the south wing of the property. The master bedroom is massive with a large window offering spectacular views. It also contains a dressing area which in turn leads to a very contemporary finished en- suite wet room. Bedroom 2 has a generous amount of wardrobe space and lovely views overlooking the garden while bedroom 3 has a similar amount of wardrobe space and lovely views over the mountain views. We mentioned the covered veranda overlooking the pool earlier and this is just part of the veranda which surrounds three quarters of the property. This property is ideal for both sun worshippers and those prefer to be in the shade. There is a big swimming pool and surrounding it are two attractive covered gazebos in the rear garden. One is at ground level and the other is raised allowing the most incredible views to the west. The current owners tell of sitting her of summers evening enjoying a cool refreshing drink while watching the sun set in the west over the Kamas peninsular. The property also includes a very generously sized separate building which is currently being used as an office/workshop but could quite easily be converted into a self contained apartment. The appearance of this already very attractive property is enhanced by the imaginative use of archways all of which add to the character of the property. To summarize, this is a high quality property which has recently been renovated to the standard of a brand new house is a very desirable area being advertised at a highly realistic price .